Increasing the Tax-Free Savings Account annual contribution limit to $10,000. Reaffirming the Government's commitment to reduce Employment Insurance premiums for over 16 million Canadians in 2017. Extending Employment Insurance Compassionate Care Benefits from six weeks to six months to better support Canadians caring for gravely ill family members. Introducing a new Home Accessibility Tax Credit for seniors and persons with disabilities to help with the costs of ensuring their homes remain safe, secure and accessible. Delivering a new and exclusive financial consumer protection framework for federally regulated banks. Expanding the voluntary mortgage prepayment disclosure commitment to non-federally regulated mortgage lenders. Launching a National Strategy to support improved financial literacy. Implementing the Taxpayer Protection and Bank Recapitalization regime for Canada's systemically important banks. Parents work hard to provide for their children, and all Canadians strive to save for a secure retirement. Since 2006, the Government has introduced several measures to make life more affordable for Canadian families, while recognizing that individuals are better placed than governments to determine their own spending and saving priorities. Economic Action Plan 2015 builds on the Government's record of support for Canadian families by keeping taxes low and introducing new measures that will further encourage individual savings, ensure that the Employment Insurance program continues to help Canadians when they need it most, and make it easier for seniors to preserve more of their retirement savings for future needs. Economic Action Plan 2015 also proposes tax relief for seniors, persons with disabilities and those who support them to make their homes more accessible. Economic Action Plan 2014 announced the Government's intention to take action to address consumer issues, reduce taxpayer exposure to housing risks, move forward with the Cooperative Capital Markets Regulatory System to address systemic risk, encourage the provision of competitive financial services, improve the governance of the payments system, and enhance the framework for combatting money laundering and terrorist financing. All of these commitments have been met. Economic Action Plan 2015 provides updates on these measures and announces a number of initiatives that will better protect Canadian consumers and enhance Canada's financial sector. The Government has taken actions since 2006 to help Canadian families succeed and prosper. These actions include introducing the Universal Child Care Benefit (UCCB), reducing the Goods and Services Tax (GST) rate to 5 per cent from 7 per cent, introducing the Tax-Free Savings Account, and introducing the Children's Fitness Tax Credit to help promote physical fitness among children. In October 2014, the Prime Minister announced further tax relief and benefit increases for all families with children. These proposed measures include enhancing the UCCB, increasing the maximum dollar amounts claimable under the Child Care Expense Deduction, and introducing the Family Tax Cut. The Government also doubled the Children's Fitness Tax Credit amount and made it refundable. Economic Action Plan 2015 builds on this record of support for Canadian families by proposing to increase the Tax-Free Savings Account annual contribution limit to $10,000. Economic Action Plan 2015 also proposes to extend Employment Insurance Compassionate Care Benefits from six weeks to six months. The Government's long-term commitment to keeping taxes low is making life more affordable for all Canadians. By reducing taxes year after year and enhancing direct benefits to Canadians, the Government has given families and individuals greater flexibility to make the choices that are right for them. An enhanced UCCB that would provide an increased benefit of $160 per month for children under the age of 6, and a new benefit of $60 per month for children aged 6 through 17, effective January 1, 2015. The enhanced UCCB would replace the existing Child Tax Credit for 2015 and subsequent taxation years. A $1,000 increase in each of the maximum dollar amounts that can be claimed under the Child Care Expense Deduction, effective for the 2015 taxation year. The Family Tax Cut, a federal non-refundable tax credit of up to $2,000 for couples with children under the age of 18, effective for the 2014 taxation year. The Child Tax Credit, announced in Budget 2007, is a non-refundable tax credit that provides a credit amount of $2,255 in 2014 for each child under the age of 18. The Child Tax Credit reduces the amount of tax owing and is calculated by multiplying the credit amount by the lowest personal income tax rate. For the 2014 taxation year, this results in personal income tax relief of up to $338 per child. The Canada Child Tax Benefit is a non-taxable monthly payment that provides federal support to families with children under the age of 18 through two primary components: the Canada Child Tax Benefit base benefit, which is targeted to low- and middle-income families and the National Child Benefit supplement, which provides additional assistance to low-income families. Only the Child Tax Credit is being replaced by the enhanced UCCB for the 2015 and subsequent taxation years. By replacing the Child Tax Credit with an expanded UCCB, all families will benefit, including families with income too low to be taxable and who could not have previously benefited from the Child Tax Credit. The Canada Child Tax Benefit is being maintained, and eligible families will continue to receive monthly benefit payments. In addition, as announced on October 9, 2014, the Government doubled the maximum amount of expenses that may be claimed under the Children's Fitness Tax Credit to $1,000 as of 2014, and made the credit refundable, effective for the 2015 and subsequent taxation years. Parents are already taking advantage of the new $1,000 maximum limit as they file their tax returns for 2014. The Government recognizes that Canadians of all ages are interested in increasing their physical fitness. To this end, the Government intends to establish an expert panel to study the potential scope of an Adult Fitness Tax Credit, to support Canadians in making healthy choices. This panel's work will inform further Government action in this area. 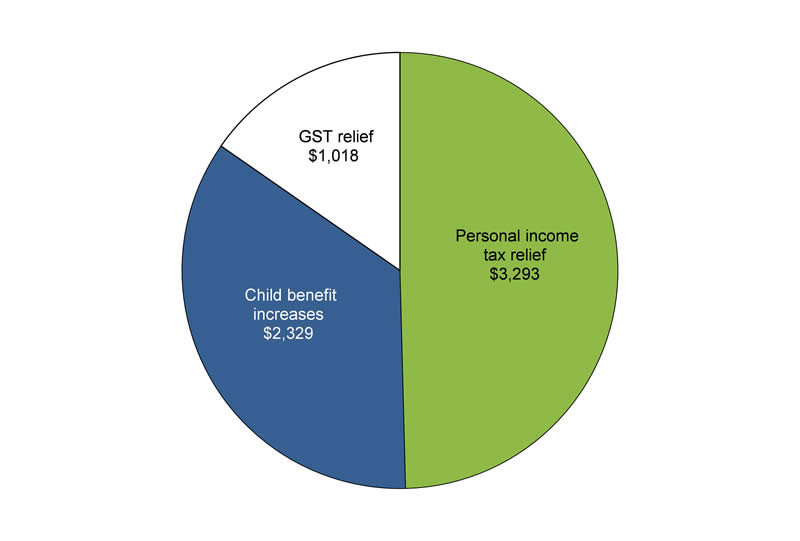 The new measures announced in October 2014, in combination with others introduced by the Government since 2006, will provide tax relief and increased benefits of up to $6,600 in 2015 for a typical two-earner family of four (Chart 4.1.1). Henry and Cathy are a couple with two children, Grace and Elizabeth. Henry earns $84,000 and Cathy earns $36,000. As a result of actions taken by the Government since 2006, their family will receive $6,640 in tax relief and enhanced benefits in 2015, allowing Henry and Cathy to invest their hard-earned money where they see fit. $1,018 from the Government's reduction of the GST rate from 7 per cent to 5 per cent. Reduced the GST from 7 per cent to 5 per cent, which benefits all Canadians—even those who do not earn enough to pay personal income tax. The Government also maintained the GST Credit level, translating into about $1.2 billion in GST Credit benefits annually for low- and modest-income Canadians. Implemented increases to the basic personal amount—the amount of income that an individual can earn without paying federal personal income tax. As a result of these increases and adjustments for inflation, the basic personal amount is $11,327 in 2015. Reduced the lowest personal income tax rate to 15 per cent from 16 per cent, and increased the amount of income that individuals can earn before facing higher tax rates by increasing the upper limit of the two lowest personal income tax brackets. Introduced and enhanced the Working Income Tax Benefit to lower the "welfare wall" by strengthening work incentives for low-income Canadians. Increased the amount of income that families can earn before the National Child Benefit supplement is fully phased out and before the Canada Child Tax Benefit base benefit begins to be phased out, meaning more families are eligible to receive the Canada Child Tax Benefit. Created a Guaranteed Income Supplement top-up benefit for Canada's most vulnerable seniors. Introduced the Tax-Free Savings Account (TFSA)—a flexible, registered, general-purpose savings vehicle—which allows Canadians to earn tax-free investment income to more easily meet their lifetime savings needs. As of the end of 2013, nearly 11 million Canadians had opened a TFSA. Helped families with children by introducing the Children's Fitness Tax Credit and the Children's Arts Tax Credit. Introduced the Registered Disability Savings Plan, a tax-assisted savings plan that helps individuals with severe disabilities—and their families—save for their long-term financial security. Enhanced support to caregivers of infirm dependent family members by introducing the Family Caregiver Tax Credit, and by removing the $10,000 limit on eligible expenses that caregivers can claim under the Medical Expense Tax Credit in respect of a dependent relative. Provided additional support to adoptive parents by enhancing and increasing the Adoption Expense Tax Credit to better recognize the costs of adopting a child. Enhanced support for workers by introducing the Canada Employment Credit, which recognizes employees' work expenses for things such as safety gear, uniforms and supplies. Provided further support to students and their families by exempting scholarship income from taxation, introducing the Textbook Tax Credit, making Registered Education Savings Plans more responsive to changing needs, and lowering the program duration requirements of the Tuition, Education and Textbook Tax Credits applying to foreign university programs. Enhanced support for students and apprentices by extending the Tuition Tax Credit to all occupational, trade and professional examination fees. Introduced the Public Transit Tax Credit to encourage public transit use, as well as tax credits for volunteer firefighters and search and rescue volunteers to better support communities. Assisted first-time home buyers by introducing the First-Time Home Buyers' Tax Credit and increasing the Registered Retirement Savings Plan withdrawal limit under the Home Buyers' Plan. Provided about $3 billion in additional annual targeted tax relief for seniors and pensioners by increasing the Age Credit amount by $2,000, doubling the Pension Income Credit amount to $2,000, raising from 69 to 71 the age limit for maturing savings in Registered Pension Plans and Registered Retirement Savings Plans, and introducing pension income splitting (benefitting over 2.2 million Canadians per year). Canadians at all income levels are benefitting from the tax relief introduced by the Government, with low- and middle-income Canadians receiving proportionately greater relief (Chart 4.1.2). More than 1 million low-income Canadians have been removed from the tax rolls altogether. Notes: Tax paid equals federal personal income tax payable for 2015 in the absence of tax relief provided since 2006. Tax relief provided since 2006 excludes increases in benefits. Economic Action Plan 2015 proposes to increase the Tax-Free Savings Account annual contribution limit to $10,000, effective for the 2015 taxation year. Canadians have many reasons to save at every stage of life. These can include saving for retirement, to start a business, to purchase a home or car, or for a vacation. Reducing taxes on savings can help Canadians achieve their goals, while also promoting investment, economic growth and jobs. In Budget 2008 the Government introduced the Tax-Free Savings Account (TFSA). Available since January 1, 2009, the TFSA is a flexible, registered general-purpose savings vehicle that allows Canadian residents aged 18 or older to earn tax-free investment income, including interest, dividends and capital gains. TFSAs can include a wide range of investment options such as mutual funds, Guaranteed Investment Certificates, publicly traded shares and bonds. Contributions to a TFSA are not tax-deductible, but investment income earned in a TFSA and withdrawals from it are tax-free. Unused TFSA contribution room is carried forward and the amount of withdrawals from a TFSA can be re-contributed in future years. The TFSA provides greater savings incentives for low- and modest-income individuals because, in addition to the tax savings, neither the income earned in a TFSA nor withdrawals from it affect eligibility for federal income-tested benefits and credits, such as the Canada Child Tax Benefit, the Goods and Services Tax/Harmonized Sales Tax Credit, the Age Credit, and Old Age Security and Guaranteed Income Supplement benefits. Canadians have embraced the TFSA for their savings needs. As of the end of 2013, nearly 11 million individuals had opened a TFSA and the total value of assets held in TFSAs was nearly $120 billion (Table 4.1.1). 1 There were about 13.9 million TFSAs at the end of 2013 (an individual may hold more than one TFSA). At the end of 2013, about 1.9 million individuals had contributed the maximum amount to their TFSAs. 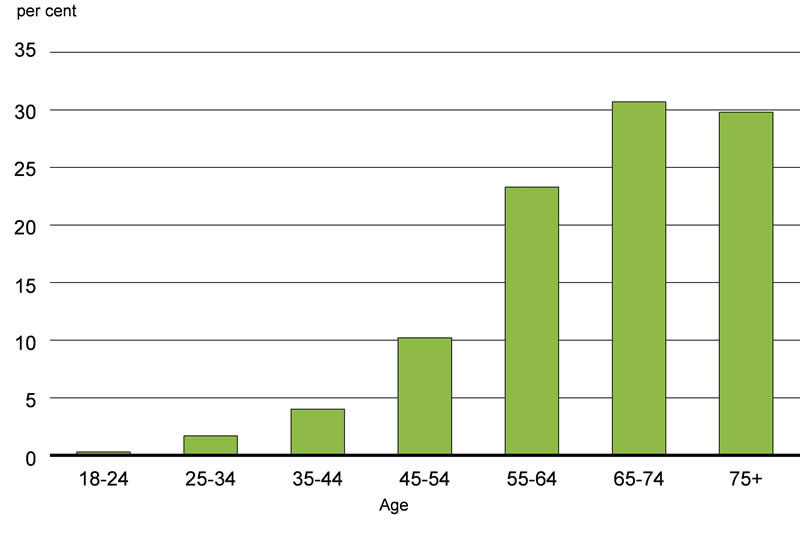 About 46 per cent of these individuals were seniors and over 70 per cent were aged 55 or over (Chart 4.1.3). 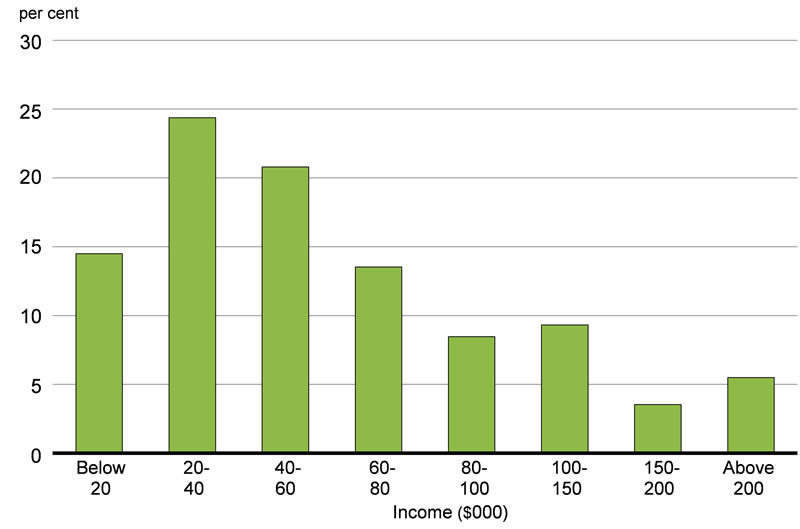 Furthermore, about 60 per cent of the individuals contributing the maximum amount to their TFSAs had incomes of less than $60,000 in 2013 (Chart 4.1.4). The TFSA was introduced with an annual contribution limit of $5,000, indexed to inflation in $500 increments. Due to indexation, on January 1, 2013, the TFSA annual contribution limit increased to $5,500. Economic Action Plan 2015 proposes to increase the TFSA annual contribution limit to $10,000, effective for the 2015 and subsequent taxation years. In combination with other registered savings plans, a $10,000 TFSA annual contribution limit will allow most Canadians to save a significant proportion of their annual incomes in a tax-efficient manner. In this context, the annual limit will not be indexed to inflation. It is estimated that this measure will reduce federal revenues by about $1.1 billion over the 2015–16 to 2019–20 period. In 20 years, it is estimated that, relative to the size of today's economy, the annual federal revenue cost of increasing the TFSA limit to $10,000 and not indexing the new limit to inflation will be in the range of $650 million, or 0.03 per cent of gross domestic product (GDP). This federal revenue cost would represent about 0.3 per cent of total federal tax revenues, under the current tax revenue-to-GDP ratio. The TFSA provides seniors with a tax-assisted savings vehicle to help meet any ongoing savings needs, thereby complementing existing retirement savings plans, which are designed to allow individuals to contribute during their working years and receive income in retirement. In a low interest rate environment, the TFSA can help to boost after-tax returns as these returns are not subject to taxation. For example, an individual earning a 2-per-cent rate of return on a fixed income investment would realize an after-tax rate of return of about 1.4 per cent in a taxable savings vehicle (assuming a combined federal-provincial tax rate of 31.2 per cent on interest income) compared to the full tax-free 2-per-cent rate of return in a TFSA, representing a 45 per cent increase in the after-tax rate of return. 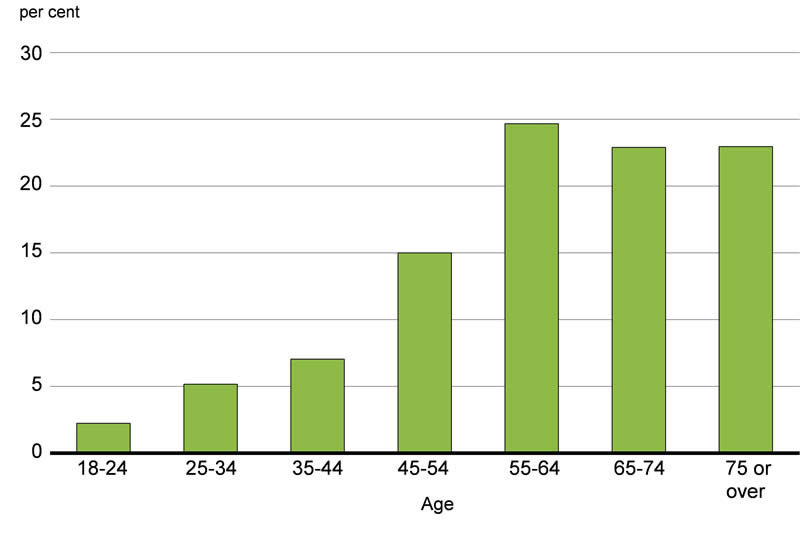 Close to 2.7 million seniors had a TFSA as of the end of 2013. Nearly 60 per cent of seniors with a TFSA had annual incomes of less than $40,000. Based on current savings patterns, it is estimated that individuals aged 65 or over will receive about 60 per cent of the benefits in 2019 from increasing the TFSA annual contribution limit to $10,000 (Chart 4.1.5). CARP members would welcome the additional help in saving [in TFSAs] for their retirement needs but more so for those of their children and grandchildren. Notes: The after-tax investment income from saving $10,000 in a TFSA at the beginning of each year for 10 years with a $10,000 TFSA annual contribution limit compared to the after-tax investment income from saving the same amount at the beginning of each year for 10 years under the existing $5,500 indexed TFSA annual contribution limit, (assuming a 2 per cent rate of inflation) with the remainder in a taxable savings vehicle. A 5.5 per cent nominal rate of return is assumed on all savings, and, for the taxable savings, a combined federal-provincial average tax rate of 21.6 per cent is assumed (based on 40 per cent interest, 30 per cent dividends and 30 per cent capital gains, and a middle-income saver). Giselle is a small business owner who saves in her TFSA. She now has the flexibility to contribute $10,000 per year to her TFSA. 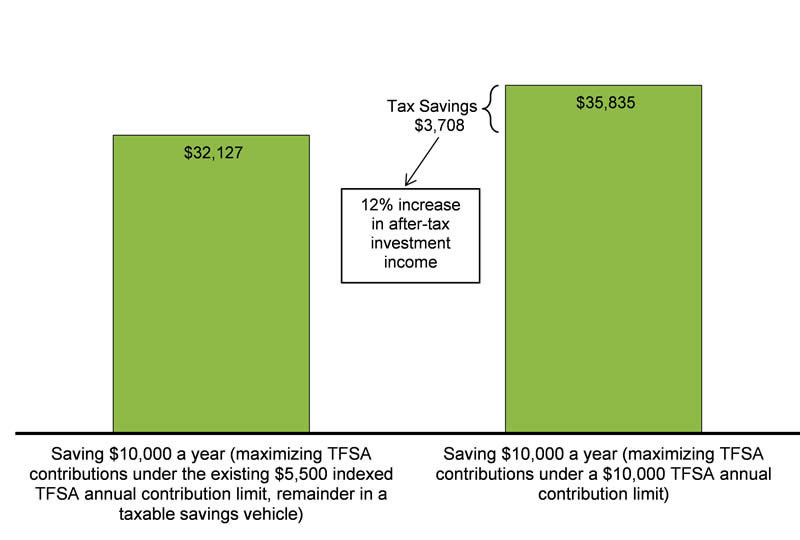 By earning tax-free investment income on $10,000 of annual savings for 10 years, Giselle could accumulate about $3,700 more in after-tax savings than if she had saved the same amount for 10 years under the existing TFSA annual contribution limit, with the remainder in a taxable savings vehicle (Chart 4.1.6). Barry, a retired 72-year-old who does part-time consulting work, is required to withdraw a minimum amount of $18,000 from his Registered Retirement Income Fund (RRIF). Taking into account his other pension income, his income from part-time consulting work and his income taxes, Barry's RRIF withdrawal exceeds his current needs by $7,000. With a $10,000 TFSA annual contribution limit, Barry can now save the entire $7,000 remaining from his RRIF withdrawal in his TFSA. Sofia, a 70-year-old widow, decides to sell her mortgage-free home for proceeds of $200,000 and to rent an apartment. In anticipation of this sale, Sofia had recently opened a TFSA with the intention to gradually transfer to it portions of the proceeds from the sale. With a $10,000 TFSA limit, Sofia may contribute every year a greater portion of the proceeds from the sale of her home to her TFSA, sheltering more of her savings from tax. In 2015, she will have accumulated $41,000 of TFSA contribution room, and, with the $10,000 annual limit, in six years she will have accumulated sufficient contribution room to contribute to a TFSA about half of the proceeds from the sale of her home. Economic Action Plan 2015 reaffirms the Government's commitment to reducing Employment Insurance premiums for over 16 million Canadians in 2017. Canadians want stable and predictable EI premium rates, and a transparent rate-setting process. In 2017, the Government will implement the seven-year break-even EI premium rate-setting mechanism, which will ensure that EI premiums are no higher than needed to pay for the EI program over time. Any cumulative surplus recorded in the EI Operating Account will be returned to employers and employees through lower EI premium rates once the new mechanism takes effect. This is expected to result in a substantial reduction in the EI premium rate, from $1.88 in 2016 to an estimated $1.49 in 2017, a reduction of 21 per cent. It is estimated that the savings from this rate reduction will benefit over 16 million Canadians, including about 2.6 million Canadians who pay no federal income tax. Damien and Taylor live in Winnipeg, Manitoba and are married. 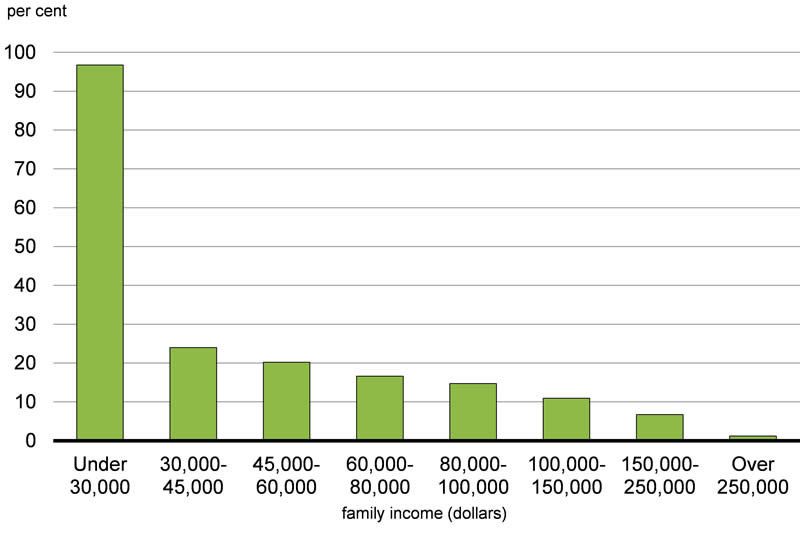 They each earn $50,000, for a combined household income of $100,000. At a rate of $1.88 per $100 of insurable earnings in 2015 and 2016, Damien and Taylor will each pay $931 in Employment Insurance (EI) premiums in those years. At an estimated rate of $1.49 in 2017, Damien and Taylor will see their EI premiums drop to $738 each, resulting in a combined savings of $386 that will stay in their family's pocket. Economic Action Plan 2015 proposes to provide up to $37 million annually to extend Employment Insurance Compassionate Care Benefits from six weeks to six months. One of the most difficult times for anyone is when a loved one is dying or at risk of death. The demands of caring for a gravely ill family member can strain the job security of workers and the financial security of their families. The Government believes that during such times, Canadians should not have to choose between keeping their job and caring for their family. Through the Employment Insurance program, Compassionate Care Benefits provide financial assistance to people who have to be away from work temporarily to care for a family member who is gravely ill with a significant risk of death. According to the Parliamentary Committee on Palliative and Compassionate Care 2011 report, Not to be Forgotten: Care of Vulnerable Canadians, family caregivers provide a substantial amount of care—some 70 per cent to 80 per cent of care given in Canadian homes and communities, worth an estimated $25 billion per year. Family and friends have been described as the invisible backbone of the Canadian healthcare system. Care giving can often place people in grave financial hardship, especially when forced to quit their job while caring for a loved one. The Government has heard from health stakeholders, such as the Health Charities Coalition of Canada, that the existing program parameters do not reflect the financial realities and hardships associated with caring for a dying family member. That is why the Government proposes to invest up to $37 million annually to extend the duration of Compassionate Care Benefits from the current six weeks to six months, as of January 2016. Through this enhancement, the Government is ensuring that the Employment Insurance program continues to help Canadians when they need it most. Elizabeth works full time, earning an annual salary of $49,500, and is eligible for Employment Insurance (EI). Elizabeth's mother is terminally ill with significant risk of death in the next six months. As a result, Elizabeth is eligible for EI Compassionate Care Benefits. With the extension of EI Compassionate Care Benefits proposed in Economic Action Plan 2015, Elizabeth would be eligible to receive benefits of $524 per week for up to six months, providing a total benefit amount of $13,624. In comparison, under the current policy, Elizabeth would only receive up to six weeks of benefits, totalling $3,144. This represents a four-fold increase in support for Elizabeth and her family during this difficult time. The enhanced benefit will allow Elizabeth to care for her terminally ill mother when she needs it most. Increased the Age Credit amount by $2,000—$1,000 in 2006 and $1,000 in 2009. Based on these increases and adjustments for inflation, the Age Credit amount for 2015 is $7,033, providing tax relief of up to $1,055 for eligible seniors. Doubled, to $2,000, the maximum amount of income eligible for the Pension Income Credit, which provides annual tax relief of up to $300 to individuals receiving qualifying pension income. Introduced pension income splitting, which allows Canadians receiving income that qualifies for the Pension Income Credit to allocate up to one-half of that income to their spouse or common-law partner for tax purposes. By splitting pension income, senior and pensioner couples can significantly reduce their income tax liability. Annually, over 2.2 million Canadians take advantage of pension income splitting. Increased—from 69 to 71—the age limit for commencing pension payments from a Registered Pension Plan and converting a Registered Retirement Savings Plan to a Registered Retirement Income Fund to significantly improve saving opportunities for seniors. Overall, actions taken by this Government have substantially increased the income seniors can earn before they are required to pay income tax. In 2015, a single senior can earn at least $20,360 and a senior couple at least $40,720 before paying federal income tax (assuming at least $2,000 per person in income eligible for the Pension Income Credit). As a result of actions taken since 2006, about 400,000 seniors have been removed from the tax rolls altogether. The Government has also strengthened the retirement income system, increased direct support to seniors and introduced a financial literacy strategy for seniors. Economic Action Plan 2015 builds on previous actions by the Government to support seniors by proposing to reduce the minimum withdrawal factors for Registered Retirement Income Funds. This measure, in conjunction with the proposed increase in the TFSA limit to $10,000, will support the retirement income needs of seniors by providing them with increased flexibility to manage their savings in a tax-efficient manner. Economic Action Plan 2015 also builds on the Government's support for seniors through the introduction of a new Home Accessibility Tax Credit for seniors and persons with disabilities. Economic Action Plan 2015 proposes to reduce the minimum withdrawal factors for Registered Retirement Income Funds to permit seniors to preserve more of their retirement savings to better support their retirement income needs. Canada has a strong, diversified retirement income system that is based on a balanced mix of public and private responsibility. Canada's retirement income system is recognized internationally as a model that succeeds in providing high levels of replacement income to seniors overall. 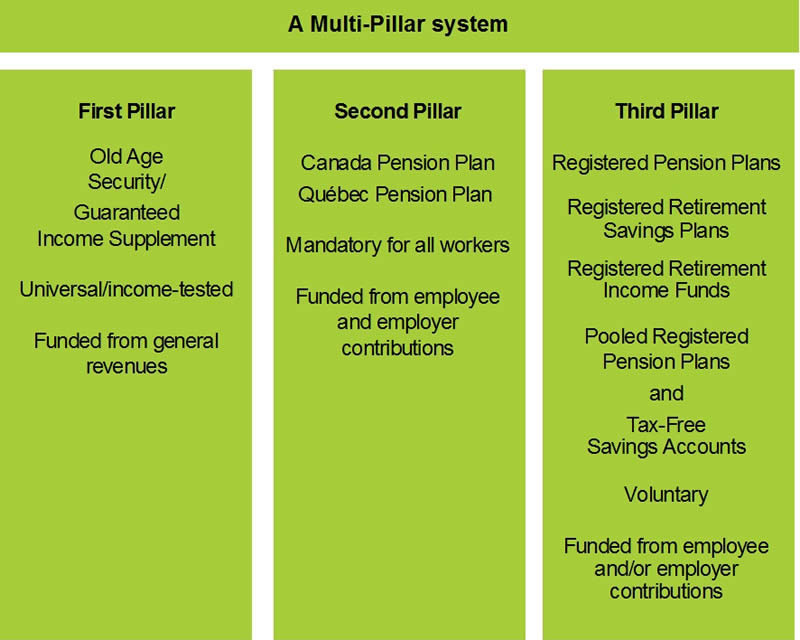 The Old Age Security/Guaranteed Income Supplement programs and the Canada Pension Plan/Québec Pension Plan form the first two pillars of Canada's three-pillar retirement income system. In order to supplement income provided by the first two pillars, many Canadians also rely on their own savings for income in their senior years. Canadians' retirement savings are typically held in tax-assisted registered plans such as Registered Pension Plans (RPPs), Registered Retirement Savings Plans (RRSPs), Registered Retirement Income Funds (RRIFs) and Tax-Free Savings Accounts, which form the third pillar of Canada's retirement income system and are key to helping Canadians save to achieve their retirement income objectives (Chart 4.1.7). According to a recent study by McKinsey & Company, 83 per cent of Canadians are on track for a comfortable retirement. The basic purpose of the tax deferral provided on savings in RPPs and RRSPs is to encourage and assist Canadians to accumulate savings over their working careers in order to meet their retirement income needs. Consistent with this purpose, savings in RPPs and RRSPs must be converted into a retirement income vehicle by age 71. In particular, an RRSP must be converted to a RRIF by the end of the year in which the RRSP holder reaches 71 years of age, and a minimum amount must be withdrawn from the RRIF annually beginning the year after it is established (alternatively, the RRSP savings may be used to purchase an annuity). This treatment ensures that the tax-deferred RRSP/RRIF savings serve their intended retirement income purpose. A formula is used to determine the required minimum amount a person must withdraw each year from a RRIF. The formula is based on a percentage factor multiplied by the value of the assets in the RRIF. The percentage factors (the RRIF factors) are based on a particular rate of return and indexing assumption. Currently, a senior is required to withdraw 7.38 per cent of their RRIF in the year they are age 71 at the start of the year. The RRIF factor increases each year until age 94 when the percentage that seniors are required to withdraw annually is capped at 20 per cent. The existing RRIF factors have been in place since 1992. Economic Action Plan 2015 proposes to adjust the RRIF minimum withdrawal factors that apply in respect of ages 71 to 94 to better reflect more recent long-term historical real rates of return and expected inflation. As a result, the new RRIF factors will be substantially lower than the existing factors. The new RRIF factors will range from 5.28 per cent at age 71 to 18.79 per cent at age 94. The percentage that seniors will be required to withdraw from their RRIF will remain capped at 20 per cent at age 95 and above. Table A5.2 in Annex 5 shows the existing and proposed new RRIF factors. By permitting more capital preservation, the new factors will help reduce the risk of outliving one's savings, while ensuring that the tax deferral provided on RRSP/RRIF savings continues to serve a retirement income purpose. For example, the new RRIF factors will permit close to 50 per cent more capital to be preserved to age 90, compared to the existing factors (Table 4.1.2). 2 Age 71 capital preserved at older ages is expressed in terms of the real (or constant) dollar value of the capital (i.e., the value of the capital adjusted for inflation after age 71). The calculations assume a 5 per cent nominal rate of return on RRIF assets and 2 per cent inflation. This measure will apply for the 2015 and subsequent taxation years. It is estimated that this measure will provide about $670 million in federal tax relief to Canadian seniors over the 2015–16 to 2019–20 period. Helen turned 71 in 2014 and converted her RRSP to a RRIF at the end of that year. At the beginning of 2015, Helen's RRIF assets amounted to $100,000. Under the existing RRIF factors, Helen would have been required to withdraw a minimum amount of $7,380 from her RRIF in 2015. Under the new RRIF factors, the minimum amount Helen is required to withdraw from her RRIF in 2015 is reduced to $5,280. Raymond was 75 at the start of 2015, at which time his RRIF assets amounted to $250,000. Under the existing RRIF factors, Raymond would have been required to withdraw a minimum amount of $19,625 from his RRIF in 2015. Under the new RRIF factors, the minimum amount Raymond is required to withdraw from his RRIF in 2015 is reduced to $14,550. Similarly, the new RRIF factors will reduce the percentage of RRIF assets that Helen and Raymond are required to withdraw in subsequent years, until after they turn 95. By reducing their RRIF withdrawals, Helen and Raymond can retain more assets in their RRIFs—assets that will continue to accumulate on a tax-deferred basis to support their future retirement income needs should they live to an advanced age. In addition, if Helen and Raymond do not need their minimum RRIF withdrawal for income purposes, they can save the after-tax amount for future needs—for example, in a TFSA if they have available TFSA contribution room. Economic Action Plan 2015 proposes to introduce a new, permanent, non-refundable Home Accessibility Tax Credit for seniors and persons with disabilities. Seniors and persons with disabilities may face special challenges related to gaining access to their home, or being mobile or functional within it. Making improvements to improve safety, access and functionality of a dwelling can be costly. In recognition of the particular impact that such costs can have, and the additional benefits of independent living, Economic Action Plan 2015 proposes a new, permanent Home Accessibility Tax Credit. The proposed 15 per cent non-refundable income tax credit would apply on up to $10,000 of eligible home renovation expenditures per year, providing up to $1,500 in tax relief. Eligible expenditures will be for improvements that allow a senior or a person who is eligible for the Disability Tax Credit to be more mobile, safe and functional within their home. These improvements could help to ensure that seniors and persons with disabilities can live healthy, independent lives in the comfort of their home or family's home. Examples of eligible expenditures include costs associated with the purchase and installation of wheelchair ramps, walk-in bathtubs, wheel-in showers and grab bars. The Home Accessibility Tax Credit will apply in respect of eligible expenditures for work performed and paid for and/or goods acquired on or after January 1, 2016. It is estimated that this measure will reduce federal revenues by about $180 million over the 2015–16 to 2019–20 period. Hélène and her husband François are seniors who live in a house that they own. As they age, Hélène and François are increasingly worried about falling. To reduce the risk of falling, the couple undertakes a number of renovations to their house in the spring of 2016. They have work done to install a walk-in bathtub and a grab bar in their bathroom. They also have non-slip flooring installed. These renovations, including the cost of the goods purchased and work performed, amount to $12,500. Hélène is able to claim $10,000, the maximum amount of eligible expenditures under the Home Accessibility Tax Credit, which results in federal tax relief of $1,500 for the 2016 taxation year. Gary is 35 years old and has used a wheelchair since he was a child. He is eligible for the Disability Tax Credit. He lives independently, but relies on his brother Steve for some support. Gary enjoys living independently and would like to continue to do so, but in a neighbourhood closer to his brother's home. He sells his house and buys another one within a few minutes of Steve's house. Before Gary moves in the summer of 2016, he has a number of renovations done to his new house, including having a ramp installed, widening the entrance to the house and all the doorways inside and installing a wheel-in shower. The renovations, including the cost of the goods purchased and work performed, amount to $9,500. Gary has no taxable income, but since he is dependent on Steve for support, Steve is able to claim $9,500 in respect of the renovations under the Home Accessibility Tax Credit. This results in federal tax relief of $1,425 for the 2016 taxation year. The Government is committed to ensuring a sound and stable financial sector that protects consumers in their dealings with financial institutions and limits risks to taxpayers. Important progress has been achieved, including higher regulatory standards for federally regulated financial institutions, reforms to the government-backed system of housing finance and support for enhancing the financial literacy of Canadians. Economic Action Plan 2015 proposes a new financial consumer protection framework for banks. When Canadians do business with banks, whether by opening a bank account or taking out a mortgage or credit product, they should be supported by a strong financial consumer protection framework. Broadened general requirements for clear and simple disclosure of information, and expanded use of summary information boxes for banking products and services. Improved access to basic banking services by allowing a broader range of personal identification to open an account. Expanded prohibitions on certain business practices, including high pressure sales situations, and cooling-off periods for a greater range of products. Expanded corporate governance requirements so that boards of directors' duties relate to all consumer protection measures. Improved transparency and accountability, for example through enhanced public reporting on complaints and on measures taken to address the challenges faced by vulnerable Canadians. A requirement that advertising be clear and accurate. These measures will benefit all Canadians, including the most vulnerable consumers. In creating the framework, the Government is delivering on its commitment in Economic Action Plan 2013 to implement a comprehensive financial consumer code, building on comments received as a result of extensive national public consultations undertaken in 2013 and 2014. We support the establishment of a financial consumer code which would be binding upon financial institutions subject to federal Government authority. We support a framework of consumer protection principles that can adapt to change. A set of principles, enshrined in the Bank Act, will anchor the framework by setting out expectations to guide the conduct of banks. As part of their public reporting requirements, banks will report annually on how their business activities meet the spirit of these principles. The Government of Canada intends that the Bank Act provide the exclusive set of rules governing consumer protection for banks. One comprehensive set of rules will allow banks to efficiently deliver national products and services and provide consumers with the benefit of knowing they have the same uniform protection when they deal with their bank anywhere across the country. The Financial Consumer Agency of Canada will ensure compliance. The Government of Canada will build on this framework and continue to engage with stakeholders, including the provinces and territories, to reflect the evolving needs of consumers. Charlie is in his first year at university and has a part-time job. He opens a savings account to help him save money for tuition and living expenses. When he reviews the paperwork, he finds that there are number of fees associated with using the account for features he does not need. Under the new financial consumer framework, Charlie would have a specific period of time to cancel the account without being subject to a cancellation fee. This will allow Charlie to consider whether there are other options that better suit his circumstances. Claire is a senior who no longer drives or travels, so she has not kept her driver's license or passport up to date. To open a bank account under the new financial consumer framework, Claire could use identification documents from a broader range of options. For instance, she could use her birth certificate and electricity bill because together, they indicate her date of birth and address. Economic Action Plan 2015 provides $5 million over five years to the Competition Bureau for investigating alleged cases of unjustified cross-border price discrimination. The unexplained and often significant gap between Canadian and U.S. prices for the same products is a frustrating and all-too-familiar reality for any Canadian who has ever shopped online or travelled to the United States. On December 9, 2014, the Government tabled the Price Transparency Act which will help tackle the practice of geographic price discrimination, one of the key contributors to the Canada–U.S. price gap. This legislation provides the Commissioner of Competition with the tools necessary to investigate alleged cases of price discrimination and to publicly report situations where consumers are unfairly targeted with higher prices. To help ensure Canadians are not charged higher prices than Americans simply because of where they live, Economic Action Plan 2015 provides the Competition Bureau with funding of $5.0 million over five years for this initiative. The Government will work with mortgage lenders to increase consumer awareness and understanding of mortgage prepayment penalty fees. To better protect consumers, the Government will invite all mortgage lenders to agree to provide enhanced information about prepaying mortgages, similar to the voluntary commitment to that effect made by Canada's banks. In 2015–16, the Government will release a National Strategy to strengthen the financial literacy of Canadians. In addition to strengthening rules to protect consumers, the Government is moving forward to further support the financial literacy of Canadians. In the fall of 2014, under the guidance of the new Financial Literacy Leader, the Government released a strategy to enhance the financial literacy of seniors. Its aim is to help seniors and near-seniors plan for and manage their finances during their later years. A National Strategy, for Canadians of all ages, will be released shortly that builds on this initial step. This Strategy will set out goals and priorities to strengthen the financial literacy of Canadians throughout their lives. Another key role for the Financial Literacy Leader will be to coordinate and engage the private, public and not-for-profit sectors to work towards common financial literacy goals. As an early example of collaboration, the Government has secured a commitment from Canada's banks to establish a five-year Financial Literacy Partnership Fund of $10 million to provide grants to eligible community organizations for projects that work to improve the financial literacy capabilities of Canadians. When hard-working Canadians have the skills, knowledge and confidence to make informed financial choices, their personal economic circumstances will benefit, and the economy as a whole will benefit as well. The Government proposes to implement its commitment from Economic Action Plan 2013 to adopt a Taxpayer Protection and Bank Recapitalization regime for Canada's systemically important banks. The Canadian financial system remained resilient throughout the 2008 global financial crisis. The experience in other countries, however, highlighted that due to their size and interconnectedness with many areas of the financial system, certain major banks can be considered "systemically important". During the financial crisis and its aftermath, authorities in many other countries used large amounts of depositor or public money to rescue systemically important banks in order to avoid the detrimental impacts of their failure on the financial system and economy. The Government is committed to making sure this never happens in Canada. The Government is proposing to adopt a Taxpayer Protection and Bank Recapitalization regime that will allow a failing bank to be restructured so that it can keep operating, without depositor or taxpayer bail-outs. This regime will be consistent with international standards and best practices developed by the Financial Stability Board and endorsed by the G-20 in response to the financial crisis. That financial stability is preserved and taxpayers and depositors are protected from having to bail out a systemically important bank in the highly unlikely event of such an institution's failure. That Canada's financial system remains strong by clarifying that systemically important banks' shareholders and creditors are responsible for bearing losses, thereby giving them stronger incentives to monitor banks' risk-taking activities. A statutory conversion power which would allow for the permanent conversion of eligible liabilities of a non-viable bank into common shares. A scope of application which ensures that deposits will not be subject to the regime. Only unsecured debt that is tradable and transferable, has an original term to maturity of 400 days or more, and is issued or renegotiated after an implementation date set by the Government would be subject to conversion. A minimum loss absorbency requirement to ensure systemically important banks can withstand significant losses and emerge from a conversion well capitalized. Comprehensive disclosure and reporting requirements. The Government intends to introduce legislative amendments to enhance the resolution toolkit for Canada's systemically important banks, including implementation of the framework for the Taxpayer Protection and Bank Recapitalization regime, with associated regulations and guidelines to follow. Systemically important banks will have a period of time to transition to the new regime. This transition will allow for a smooth adjustment by affected banks, investors and other market participants. The Government will ask Canada's systemically important banks to be responsible for preparing resolution plans that set out how each bank could be resolved in the unlikely event that recovery actions fail. Adoption of a holding company structure for systemically important banks will not be required to accommodate the new regime. The Government will continue to ensure the housing finance framework reduces taxpayer exposure and supports the long-term stability of the housing market and financial system. The Government has recently made improvements to the housing finance framework to restrain the growth of taxpayer-backed mortgage insurance and securitization and enhance stability. These include increasing fees on National Housing Act Mortgage-Backed Securities and Canada Mortgage Bonds, and capping annual issuance on new guarantees under these programs. The Government has adjusted the rules for government-backed mortgage insurance four times since 2008, including requiring a minimum down payment of 5 per cent and establishing a maximum amortization period of 25 years for mortgages with a down payment of less than 20 per cent. CMHC annually reviews its mortgage insurance premiums, with the most recent premium increase announced on April 2, 2015. CMHC continues to review its mortgage insurance product offerings in line with Government objectives and implemented changes in 2014. CMHC reduced its annual issuance of portfolio insurance from $11 billion to $9 billion in 2014 and maintained that level for 2015. Fees for CMHC securitization programs have been increased to narrow the cost differential with other funding sources and encourage development of private market funding instruments. The Minister of Finance set the amount of new guarantees that CMHC is authorized to provide under its 2015 securitization programs at $80 billion for market National Housing Act Mortgage-Backed Securities and $40 billion for Canada Mortgage Bonds. A new legislative framework for covered bonds is in effect, which has created a fully private source of funding using only uninsured mortgages as collateral. Outstanding issuance was over $60 billion as of February 2015. The Government is moving forward to implement the Cooperative Capital Markets Regulatory System, in partnership with provinces and territories. Following additional public consultations, the Government intends to take legislative actions to strengthen Canada's capital markets framework and better protect investors. In addition, the Government intends to make legislative amendments to fight white-collar crime that will allow the Financial Transactions and Reports Analysis Centre of Canada to disclose relevant information to provincial securities regulators. British Columbia, Ontario, Saskatchewan, New Brunswick, Prince Edward Island, Yukon and Canada are jointly engaged in the creation of the Cooperative Capital Markets Regulatory System. The Cooperative System is designed to preserve local perspectives while streamlining the capital markets regulatory framework to enhance Canada's financial services sector, support efficient capital markets and manage systemic risk. Participating jurisdictions are making progress on refining a federal-provincial legislative framework and developing a harmonized regulatory rulebook. Participating jurisdictions will release this summer updated consultation draft capital markets legislation, along with draft initial regulations, for public comment. The responsible Ministers of the participating jurisdictions will appoint in the coming months an initial board of directors for the new Capital Markets Regulatory Authority. Along with its provincial and territorial partners, the Government continues to invite all provinces and territories to participate in the implementation of the Cooperative System. If jurisdictions choose to operate outside the Cooperative System, they will have a constructive partner in the new Authority, with the ultimate goal of providing efficient access to capital markets. Uniform provincial capital markets legislation to deal with provincial aspects of securities regulation. Complementary federal capital markets legislation to address criminal matters and systemic risk related to capital markets. A jointly established Capital Markets Regulatory Authority to administer both the provincial and federal legislation. A single set of regulations designed to protect investors, while supporting responsive, efficient and innovative capital markets. Priorities set on a national basis based on a single executive team, organized throughout the country, and accountable to an expert board of directors. Single filing of prospectus with review conducted by the local office of the capital markets regulatory authority. Fees established to fund the regulatory system, not to raise general revenue for participating governments. Economic Action Plan 2015 proposes to support effective oversight of the financial sector and government entities. The Government will propose legislative amendments that will modernize, clarify and enhance the protection of prescribed supervisory information that relates to federally regulated financial institutions. This measure will enhance confidence in the supervisory process and the stability of the financial system. The Government will also review Part IV of the Financial Administration Act to ensure that it continues to reflect and accommodate modern market practices for the prudent management of Canada's finances, as well as statutes relating to federal financial sector oversight and governing certain Crown corporations to ensure effective governance and operations. Canada's institutional framework for oversight of the financial sector involves the Department of Finance, the Bank of Canada, the Office of the Superintendent of Financial Institutions, the Canada Deposit Insurance Corporation, and the Financial Consumer Agency of Canada. Each organization has a different and clearly defined mandate, and there is active collaboration and information sharing among them. The Senior Advisory Committee (SAC), chaired by the Deputy Minister of Finance, which supports the provision of advice on a broad range of issues related to the stability of the Canadian financial system and legislative, regulatory, and policy issues affecting the sector. It is expected that the Capital Markets Regulatory Authority will contribute to SAC deliberations after it has begun operating. Economic Action Plan 2015 proposes to provide $15 million over five years, starting in 2015–16, to continue the National Counterfeit Enforcement Strategy. Canada's polymer bank notes employ leading-edge security features that make them difficult to counterfeit, which in turn helps ensure that Canadians can be confident in the value of their bank notes. To further ensure the confidence of Canadians, Economic Action Plan 2015 provides $15 million over five years to the Royal Canadian Mounted Police and Public Safety Canada to continue the National Counterfeit Enforcement Strategy. The National Counterfeit Enforcement Strategy provides dedicated resources for the enforcement, prosecution and prevention of currency counterfeiting. This highly successful program has resulted in a 94 per cent decrease in counterfeit activity in Canada since its inception. The Government is supporting the growth and competitiveness of credit unions. Credit unions are an important part of the Canadian economy and contribute to competition in financial services. They are key suppliers of financing to small and medium-sized businesses and serve Canadians across the country, especially in smaller communities and rural areas. The Government has taken a series of concrete measures to support the growth and competitiveness of the credit union sector since 2010. For example, a federal credit union framework has been legislated, which provides a choice to individual credit unions and their members seeking to grow regionally or nationally. Regulatory responsibility for provincial credit union centrals has also been clarified and there will be a transition towards implementation. Looking ahead, the Government will continue to engage stakeholders and work collaboratively with the credit union sector on its future development and on ways to meet the needs of the evolving sector. Action is being taken to support the development of efficient, innovative and sound payment systems. To address the high cost of credit card acceptance, in November 2014 the Minister of Finance accepted separate and individual voluntary undertakings from Visa and MasterCard to lower their average effective interchange rates to 1.50 per cent for the next five years. This represents a reduction of close to 10 per cent, with specific emphasis on small and medium-sized enterprises and charities, which have the least amount of bargaining power. This meaningful long-term reduction in credit card acceptance costs will provide relief to merchants and help keep prices low for consumers. In addition, the Government released on April 13, 2015 an enhanced Code of Conduct for the Credit and Debit Card Industry in Canada to extend its provisions to mobile payments and introduce new fee disclosure, dispute resolution mechanism, and branding requirements. The enhanced Code of Conduct will strengthen merchant choice, transparency and disclosure, and fairness in the payment card market. For example, merchants now have added flexibility to cancel their contracts without penalty and limit the automatic renewal of contracts that no longer meet their needs. Consumers also benefit from the Code, for example by having full and unrestricted control over default settings on mobile devices and mobile wallets to allow them to choose which payment method they want to use. Payment innovations offer benefits to consumers, such as greater convenience and speed, but they must be operated in a responsible manner so that Canadians continue to have confidence in the payment system. The Government is currently consulting on the oversight of retail payment systems to support competitive and innovative ways to meet the payment needs of Canadians while ensuring that the payment system remains safe. [The Code of Conduct for the Credit and Debit Card Industry] has served merchants extremely well…[It] has done an excellent job in ensuring some fair ground rules and maintaining Canada’s low-cost debit system. I am delighted that merchants will have full choice in which networks and payment methods to accept. The reduction in interchange fees for charities is a significant victory. The Government is supporting greater availability of pension savings vehicles. The Government has developed and implemented a framework for Pooled Registered Pension Plans (PRPPs), which will provide a low-cost and large-scale retirement savings option for the more than 60 per cent of Canadians who do not have access to a workplace pension plan. Federal PRPPs are now available to employers and employees in federally regulated industries as well as individuals living in the Northwest Territories, Nunavut and Yukon. The federal PRPP framework has served as a model for provinces as they continue to develop their own PRPP legislation. Quebec's version of PRPPs, the Voluntary Retirement Savings Plan is fully in force and available to Quebec residents, while several other provinces have passed PRPP legislation and are developing regulations. The Government is leading an initiative with the provinces to harmonize the supervision of PRPPs across Canada to achieve lower costs through a multilateral agreement. The Government also continues to assess a voluntary Target Benefit Plan option for Crown corporations and federally regulated private sector pension plans. The Government understands the importance of ensuring that any changes to the federal pension regime protect benefits that have already been earned by requiring that plan members and retirees consent to the treatment of accrued benefits at the time of plan conversion. In addition, given that a number of provinces are moving ahead with the development and implementation of Target Benefit Plan frameworks for their jurisdictions, the Government will consider modifications to the income tax rules to appropriately accommodate Target Benefit Plans within the system of rules and limits for Registered Pension Plans. The Government has laid the foundation for increased Canada-China trade and investment. In November 2014, Canada and China agreed to a set of measures to support the increased use of China's currency, the renminbi, in trade, commerce and investment between the two countries. These measures included the designation of a renminbi clearing bank in Canada, the establishment of a reciprocal currency swap line between the two countries' central banks and the granting of a quota to Canadian financial institutions for investment in China's capital markets. The clearing of renminbi-denominated transactions between Canada and China commenced on March 23, 2015, and is expected to result in lower transaction costs and more favourable credit terms for companies trading with or investing in China, thereby encouraging additional bilateral trade activity. This initiative [will] help facilitate increased investment and trade and strengthen Canada’s broader economic relationship with China. The potential benefits of an RMB settlement/service centre, like increasing Canada-China international trade, are seen as being very significant—not only in terms of reducing currency transaction costs but also increasing the overall convenience and efficiency of international CAD-RMB payment transactions.